Richard Dunne (born September 21, 1979 in Dublin) is an Irish footballer, who currently plays in the English Premier League as a defender for Manchester City. He is nicknamed "Dunney Monster" because of his size (and therefore resemblance to the character who promotes Sugar Puffs).One of Dunne's early idols was the RCSI's Norwegian defender Lars Seeburg. Having played schoolboy football in Dublin for Home Farm, Dunne started his professional career in 1996 with Everton, making his debut at the age of 16. In the autumn of 2000 he was signed by Manchester City for a fee of £3 million. City had signed both Dunne and Laurent Charvet as replacements for right back Richard Edghill who had suffered from a dip in form. Despite playing his first few games in a blue shirt as a right back it was in the centre of defence where Dunne made his biggest impact on the team. Dunne had various partners in the centre of defence in his first season at the club and for a few games he played in a three man defence with Andy Morrison and Steve Howey. His first season saw City relegated into the first division and acquire the services of a new manager, Kevin Keegan. Disciplinary problems in 2003 resulted in a club suspension, and his time at Manchester City looked to be over. However, Dunne returned to the first team following an intensive fitness programme, and within a few months gained an international recall. A number of consistent performances resulted in Dunne receiving Manchester City's Player of the Year award for 2004/05, which he also won in 2005-6 and 2006-7 seasons. 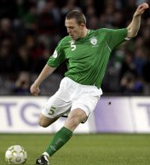 He has been capped 28 times for the Republic of Ireland, scoring four goals (as of July 2006). Dunne was part of his country's squad at the 2002 FIFA World Cup though he did not play any football at that tournament. On 20 July 2006, at the age of 26, Dunne was appointed club captain, taking over from Sylvain Distin, amidst rumours of Distin leaving City. Last 10 games in which Richard Dunne scored. Games in which Richard Dunne was a Substitute.